Match each of these games with the breathless quotation from its review. A. "A knockout in just about every way it can be... you owe it to yourself to rush out and buy this." B. "There are so many aspects... that make it an experience above and beyond all other open world sandbox experiences that we can't even begin to list them all. Some of the reasons that stand out are a wealth of content, a beautifully rendered and detailed world, an interesting and engaging storyline, a fantastic roster of characters with their own personalities, great and believable dialogue, the ability to experience the game world online with or against others; the list can go on forever. Rest assured that this is one of the greatest game we've played in 2010 so far, and possibly ever." C. "There is simply not a better, more complete shooter on the market, and with all this content, there isn't any way you can find something that you cannot sink your teeth into." D. "I have never played anything so momentous or revolutionary... In the coming years I expect the game's influence to be felt throughout the industry in terms of gameplay, storytelling and interactivity. This is a game that deserves all the plaudits it can get. So please go out and buy [this game] and reward those that have made such a groundbreaking videogame event." E. "Far exceeded our expectations and is without question one of the best games we've played. Use whatever positive description you'd like. System seller, potential game of the year, landmark achievement; just make sure you buy it immediately." F. "With a ton of incredible levels to conquer; gorgeous, perfectly designed graphics (wait until you see the first sunset level! ); retro-inspired music; and smooth, flawless gameplay, videogames don't get much better... I can't recommend this game enough." G. "Easily the best FPS I've played in a long time. Dialogue that makes me want to watch a feature film starring these guys. A virtually flawless single and multiplayer experience." H. "One of the best first person shooters this year, and is obviously a must have for any action fan. Intense, gory and quite brilliant, maybe it's not refreshing but at the same time it's a stunning game." I. "Across-the-boards perfection [that] can't be measured by any scale. It's simply in a class by itself. This is where games need to go for my money... A modern-day masterpiece." J. "This is a rare occasion when the hype can actually be justified; ...quite simply, a masterpiece." Which game is Destructoid calling close to perfect? A. "Judged as a piece of entertainment, as a game that consistently surprises and amazes and leaves jaws hanging... It's pretty close to perfect." B. "About as close to perfect as you're going to get." C. "It's warm and satisfying with a near-perfect consistency throughout." D. "It delivers a near-perfect competitive experience, in a way that few games... can." E. "...as close to perfect at what it does as a game can get." Compiled with thanks, and apologies, to Metacritic. Dance Central; or, what is Kinect for? 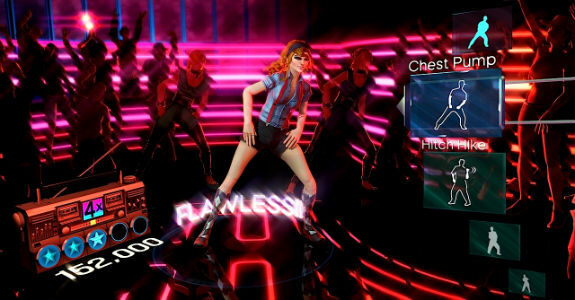 My review of Dance Central is up at thephoenix.com. I spent a good bit of it on the recent developments surrounding Harmonix, maybe a little too much. But, really, Dance Central is simple to explain and works as advertised, so what more needs to be said? Without having played any other Kinect titles except for Kinect Adventures, I feel comfortable saying this is the best reason to get a Kinect. I never tried out the hardware when it was in development. My first experience with Kinect was when I bought one. After checking Best Buy for a couple of days without success, I stopped at a Toys R Us on a whim and they had several in stock. Part of the allure of Kinect is that you can control what's onscreen both with gestures and with voice, and I think it's going to take some time for developers to figure out which function works better for which applications. The Minority Report-style grabbing and pulling of menu options works quite well when you're browsing the Kinect hub. To actually select something requires you to hold your hand still in mid-air for a good second or so. It's hard to see how that's an improvement over a split-second button press. You can also use voice command here, and it seems dicey. If other people in the room are talking, the Kinect doesn't pick up your voice. Sometimes it doesn't pick up your voice even if no one's talking. Sometimes it misinterprets what you said. And it's a slow process. You say "Xbox!" and then wait for it to acknowledge that it's now in voice command mode, at which time you can give the real command. Again, this is not actually an improvement over using a joypad. Awhile back, I wrote a defense of the standard gamepad, in which I argued that, complicated though today's controller is, it has also evolved to do lots of things really well. Kinect does not seem to do most of the traditional controller things well. What the controller does best is translate minimal player input into maximal onscreen action. Moving the analog stick a few degrees is the difference between your character tiptoeing and sprinting. Kinect, it seems, requires big movements on your part to do something as simple as pausing your game (hold your left hand out at a specific angle for several seconds). Kinect obviously has loads of potential. About half the time, it works so well that it feels like there's an alien intelligence in your living room. And about half the time it takes a dump. The challenge is going to be for developers to figure out how to use it. It simply will not work if they try to shoehorn motion controls onto traditional games. This is a lesson that took a year or two for studios to learn with the Wii and DS, and I expect that at this time next year we'll be looking at some games that make good use of the hardware. For now, it seems like Dance Central is it. *I've mostly suppressed the memory at this point, but as I recall, the process for setting up the 32X involved putting metal clamps inside the Genesis's cartridge slot to hold the doors open, only the clamps were thin and tended to fall inside the slot, at which point the doors closed and they were impossible to get out. The 32X also had numerous passthrough cables, its own power supply, and I think you had to make a burnt offering each time you turned it on. 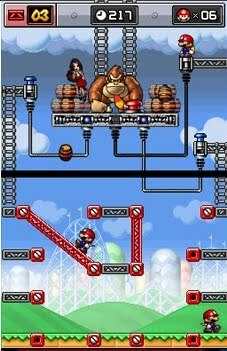 Mario vs. Donkey Kong: Mini-Land Mayhem! My review of Mario vs. Donkey Kong: Mini-Land Mayhem! is up now at Joystiq. This game was a nice surprise. I had no expectations for it. In fact, I hadn't even heard of it until the review was offered to me, and I got the sense that they were foisting it off on the new guy. Which was fine with me -- I was happy enough to be contributing to Joystiq. That Mario vs DK turned out to be pretty darn good was a bonus. In this case I don't have much to add to what's in the review. This isn't the flashiest game coming out this fall -- not even the flashiest one starring Donkey Kong -- and it's not required playing, but it certainly is a hidden gem. If you're at all inclined toward games like this, check it out. My review of Rock Band 3 is up at thephoenix.com. This is one where I gave the game a high score, and then spent all my column inches talking about my reservations. And I didn't even get to all of them! Or this: Some of the tracks that come on the Rock Band 3 disc don't even include a keyboard part. If you needed further proof that the keyboard player is the most uncool person in the band, there you have it. The improved drop-in and drop-out capabilities help, but it's still disappointing when you want to play the new instrument only to find that your singer wants to play something that doesn't support it. 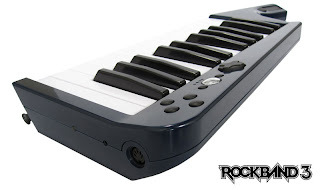 Or this: Even though all the DLC you've previously downloaded will work in Rock Band 3 (a definite improvement over Beatles), it does not include keyboard support, even for songs that are crying out for it. Really? You're telling me the Killers have "no part" for keys? I understand why it has to be this way, but that doesn't mean I have to like it. This Joystiq story seems to indicate that it will never be possible to upgrade most of these past tracks, and if it is, you'll have to pay for it. In fact, as a huge Rock Band fan, I'm starting to feel gouged. By the game's count, I've already downloaded 88 songs, which at about two bucks a pop is almost $180. The keyboard bundle was $129 (and no, I didn't get a free copy). If I want the pro guitar, that'll be $150. The Squier that comes out next year is $280, and you need the $30 adaptor for it to work. The notion of Rock-Band-as-platform was one I supported, but I didn't realize it was meant literally. Rock Band now costs more than Kinect. Pro mode changes everything. While I still pump my fist at the end of a song when I'm on guitar, and while I still prefer drumming to anything else, the idea that I am playing real music on the keyboard tickles a completely different region of my brain. Within an hour of starting the pro keys tutorial, I was successfully playing scales without looking at my hands. How long would that have taken without the aid of the game? Playing pro mode is an order of magnitude more difficult than playing regular keys, and at this point I am still muddling through on easy or medium difficulty. I'm reminded of my difficulty learning to drum, but playing the keyboard is much more complex. The biggest obstacle isn't following the note chart onscreen, it's finding the correct key. If you're one of those people who think games aren't challenging enough anymore, here's the one for you. *Let's not get pedantic here, people. You know what I mean.